Doesn’t this recipe sound ridiculously delicious? The first hint of fall has me reading cookbooks and scouring magazines for new concoctions to whip up in the kitchen. I found this gem in a favorite cookbook called How to Pick A Peach: The Search for Flavor from Farm to Table. 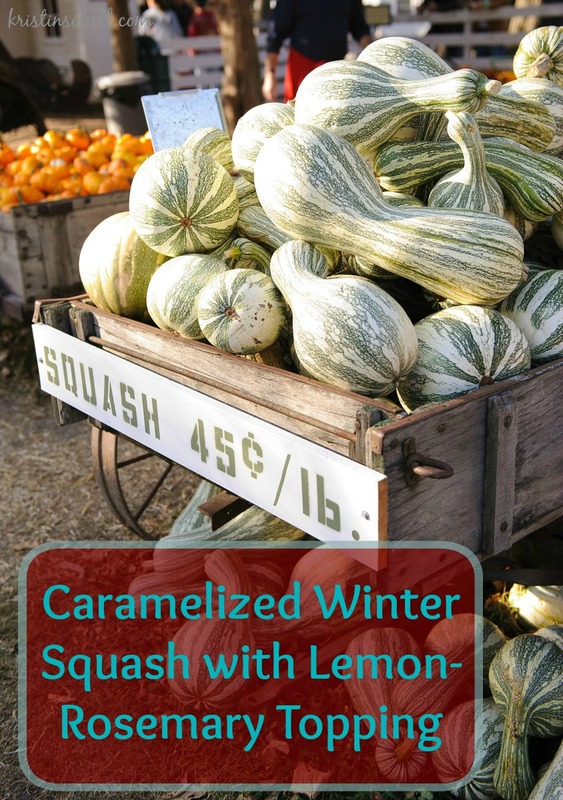 Who wants to try out the Caramelized Winter Squash recipe with me this weekend? We can compare notes — it’ll almost be like cooking in the kitchen together. I’m going to use butternut squash for ours. Just a little tip: some grocery stores sell squash pre-cubed, but if you ask someone in the produce section to cut your big-ole squash in two for you, it’ll save you the head ache of finding a knife big enough for the task. Let me know if you’re in! Savory & sweet caramelized squash with fresh flavors of fall. A perfect side dish for roasted chicken. Combine rosemary, lemon peel, and garlic in a small bowl. Add just enough lemon juice to moisten. Stir to combine. Crush the ingredients together with the back of your spoon to make a little paste. Heat the olive oil in a large non-stick skillet with a lid. When oil is hot, add the squash. Sprinkle with salt and stir until coated with oil and salt. Cover with lid and cook, without stirring, for 2 minutes. Remove lid and stir the squash – it should be caramelizing. Cover and continue cooking, checking the squash every couple of minutes to make sure it’s caramelized, not burning! Cook until the squash is just tender, about 5 minutes. Sprinkle rosemary mixture and the remaining lemon juice over the squash. Toss to coat. Add salt & pepper to taste. Transfer to a serving dish, top with toasted pine nuts and serve.